Different Therapeutic Modalities for Common Bile Duct and The Gallbladder Stones (a prospective randomised study)Background: The aim of this study is to compare the laparoscopic approach and endoscopic stone removal in the management of common bile duct and the gallbladder stones . Methods: In 2008-2010 years,70 patients presented with common bile duct and the gallbladder stones that were diagnosed by clinically and radiologically. Patients were divided into two groups according to the therapeutic procedures: group 1(n=35) included patients who underwent endoscopic retrograde cholangiopancreatography (ERCP) and laparoscopic cholecystectomy . Group 2(n=35) included patients who underwent laparoscopic common bile duct exploration.Main outcome measures: The primary outcome measure was efficacy of stone clearance from the common bile duct. Secondary end points were length of the operation period and hospital stay, complications, pertaining to demography, return to work and morbidity.Results: The baseline characteristics of the 2 randomized groups were similar. Efficacy of stone clearance was likewise equivalent for both groups. Group 1 included 19 men 16 women; mean age 48 (32-76), in group 2; 21 men 14 women mean age 52,2 (36-70). The length of the operation periods in group 1( 82; 64-100min) were shorter than group 2 (98,5; 44-160 min.) The period of hospital stays were approximately same, group 1: 2,9 days(2-8 days), group 2: 2,6 days (1-9 days). Group 1 had 3 complications (8,5 %); 2 pancreatitis and 1 papillar bleeding that responded to conservative treatment, group 2; 2 patients had prolonged bile drainage through cyctic drain needed endoscopic sphincterotomy(6,1%) . Return to work period were 18 days (8-22 days) in group1, 16 days (10-20days) in group2. Conclusions: common bile duct was cleared completely in both prosedures. Complication rates in group 2 were lower than group1. 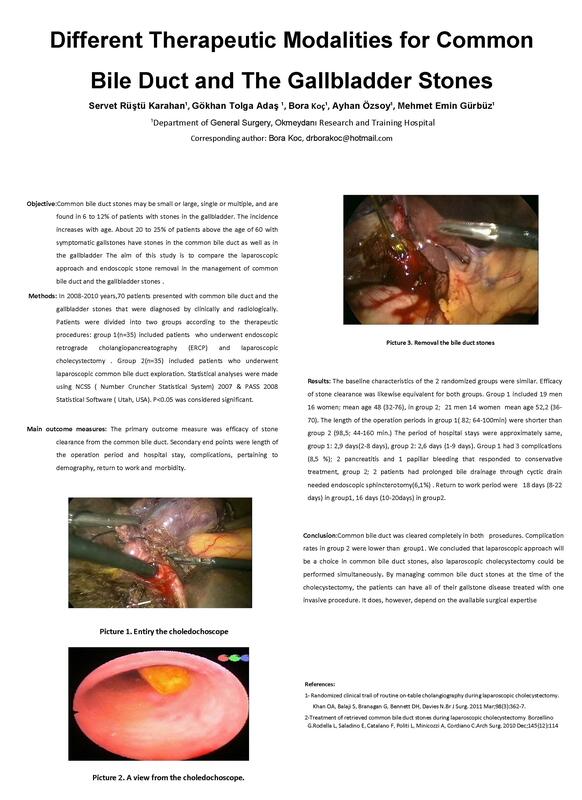 We concluded that laparoscopic approach will be a choise in common bile duct stones, laparoscopic cholecystectomy could be performed simultaneously.